A little over 20 years ago, at the 1994 Cleveland Auto Show, I saw an E38 for the first time. I thought the car looked pretty cool, and immediately grabbed a poster to put on my bedroom wall. While I did have the quintessential Ferrari F40 poster, I also made room for this one. I guess the car looked pretty cool for 9-year-old me. A few years later, I remember watching Tomorrow Never Dies at the cinema with my mother, and being really excited when 007 used an E38 to wreak havoc in a parking garage in Hamburg. As a huge James Bond fan, I was now more determined than ever to own one of these. Small problem: I was 12, and I lived in Brazil. It would have to wait. Fast forward 14 years, and I’m now living in Canada and looking for my first car… And I decide to check how much an E38 cost. When I saw they were around $5000-$8000, I figured “wow, so cheap, must buy!”. It was my first car purchase, and as such it was a mixture of bliss and pure terror. A steep learning curve, so to speak. The car turned looked pretty good inside and out, but the engine… Oh my. The engine was awful. Leaked oil everywhere, ran a little rough, but I didn’t care. I paid somewhere around $5000 Canadian, and drove it home a few days after seeing it. I figured fixing the leaks would be cheap. Long story short, after spending a few thousand dollars at a local mechanic fixing up a bunch of issues, the car’s timing chain guides died a horrible death in a cold Winnipeg morning. I was devastated, but my father had actually bought an E38 from a local enthusiast. The car was loaded with cool options and retrofits, such as hydraulic trunk, suede headliner, and Steptronic, and seemed reasonably well taken care of. I bought it off my father for an undisclosed sum, and proceeded to drive the heck out of it until late 2013. Unfortunately, this car also died a horrible death due to timing chain guides, also on a cold Winnipeg morning. Having spent more than $10k to drive less than two years left me quite mad. I resolved that I would research the E38 thoroughly, and only buy one that’s well taken care of, or super cheap, or both. In late 2014, it seemed like I had found the perfect example: A 1997 750iL Individual, Canadian-spec. Limonit Metallic paint, with a Walknappa Lotus White interior, inlaid wood trim and a fridge! Super classy. I contacted the seller, and anxiously awaited the date we had set for me to view the car. 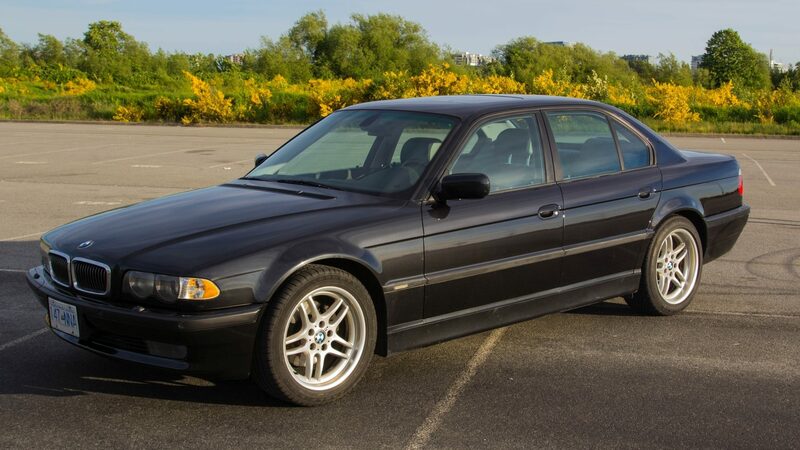 Luckily for me, a few months later a somewhat clean Black on Black 2001 740i Sport popped for sale, cheap. Unfortunately, it had a check engine light for timing… I decided to make a huge gamble, and drove it home a few days after looking at it. I tried a cheap fix, and lo and behold it worked! 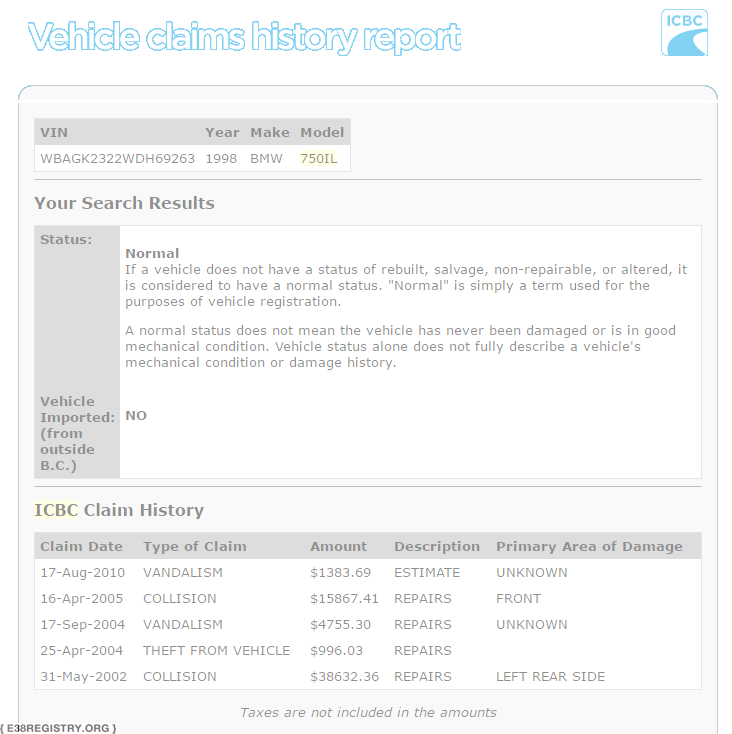 I now had an E38 with maintenance history going back more than ten years. I felt I could definitely work with this one. The car had many cosmetic issues. Broken trim, missing pieces, worn seats, the usual. At least the front cupholder worked and the headliner wasn’t sagging. Mechanically, it was “fine”. Soon after purchase, the water pump gave out, but it was a repair I had done before. One of the pulleys also went out, clattering like timing chain guides and nearly giving me a heart attack. Replaced pulley and belts, and all was fine. Did front brakes recently, and will probably have to replace the driveshaft (ouch) and rear brakes (not ouch) soon. Unlike my previous E38s, this car has lasted long enough to modify it! I added some replica AC Schnitzer bits and pieces (originals are non-existent on the market), installed Active Comfort seats, swapped in a whole Individual interior from a UK 740i Sport, and even installed a rear fridge out of an E65. I love how it looks now, and it’s been a great learning experience. But back to the Registry. I’ve known about the existence of The M Registry, 8coupe.com, Wuffer.ca and the CS Register for several years, and they all served as inspiration in one form or another. They’re super interesting projects, and serve as a repository of information for their respective models. While researching the E38, I noticed no such repository existed for the E38. 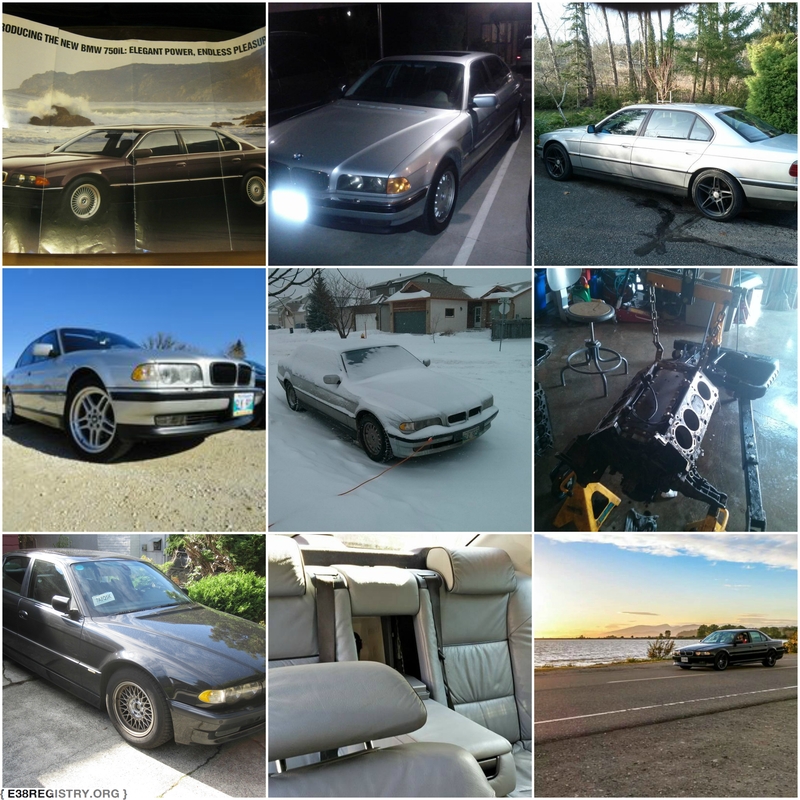 Sure, there are great resources like E38.org, but it’s aimed at the DIY’er rather than at people who want to learn more about the car. Additionally, I’ve always been curious to see how rare the E38 is these days. I see very few of them around, and given that this car is likely the last good looking BMW 7-series, it’s quite a pity. So I decided to do something about it. I bounced the idea off of several other enthusiasts (special shout-out to Tim in Australia and Jose here in Canada, for the incentive and suggestions), and bit the bullet in July 2015, and set up a server and a domain. And started to collect as much information as I could find on the E38. Finding the whereabouts of every single E38 ever made will be impossible. Many have been crushed with no records, some were certainly lost to wars (it was quite popular in the Middle East) and thousands more are likely broken and parked. However, I have an initial goal of accounting for 1% of the production run, which is roughly 3,300 cars. So, if you have an E38, or if you’ve parted one out, or seen one at a junkyard somewhere, send me their VINs to cars@e38registry.org! If the E38 is currently operational, send me your first name, country and a few pictures to cars@e38registry.org, and I’ll create a page for it and add it to the list of known running E38s! Thanks for reading this, and keep an eye on future updates through our Facebook page (link), Instagram account (link) or by simply coming back to the website from time to time.